How to smoke meat indoors on a stove. Recipe for cinnamon tea smoked duck. As the URL of this website suggests, my dinner inspirations often come from ingredients rather than recipes. Ingredients that are seasonal, and abnormally fresh are a good start, but I often find the most inspiration in the unusual. Then there are the times, that inspiration is born out of necessity. Last week, I had a very large muscovy duck breast lingering in the fridge. The unused half of a pair from a past experiment. It was nearing the end of its useful life and I knew it needed an intervention, or it would go to waste. A long day at work and some bad news made the mere thought of cooking unpalatable, so I tossed in a marinade to buy myself a few more days. At the time, I figured I could chop it up and stir fry it with some veggies the next day. Nothing revelatory, but it would have made a nice weeknight meal. Of course things are never that clear cut in my kitchen, and a splendid pile of green (yes, as in unripe) mangos at the grocery store inspired a new direction for the lonely scrap of duck aging in my fridge. A bag of black tea sitting in the wicker basket under the table, some Cassia bark (Vietnamese cinnamon) in the pantry, and Vietnamese perilla for the slaw; one by one, the ingredients started to fall into place and suddenly my stir-fry had migrated closer to the equator. For apartment dwellers like me, smoking meat is a luxury we always wish we had. I’d heard of people wok smoking food indoors though and although I don’t own a wok, I figured I could rig something together with what I do have. And you know what? It works! By using some tea, sugar, herbs and aluminum foil, you can imbue some wonderfully aromatic smoke flavor into just about anything without a brigade of fire trucks surrounding your building. A quick sear in the pan after smoking, and I had a perfectly cooked duck breast with crispy skin, and a delicate smoky flavor laced with the sweet aroma of cinnamon. The tangy green mango slaw underneath provided the perfect flavor and texture contrast to the duck. Crunchy, vegetal, and fresh, the slaw provides a palate cleansing foil that let’s you taste each bite of the earthy duck, as if for the first time. The night before smoking the duck, put them in a gallon sized freezer bag with the hoisin sauce, salt, ground cinnamon, and pepper. Get as much air out of the bag as you can then seal it. Smoosh everything together to distribute the spices and coat the breasts evenly. Put the bag in the fridge until an hour before you smoke the duck. Normally, people use a wok to do this, but I don't own a wok, so I used a cast iron skillet. You could really do this with any heavy bottomed pan with high sides and a lid. Make sure the pan is not non-stick (high temperatures make non-stick coating release toxins), and that you don't mind discoloring it (the high heat may discolor stainless steel). Line your chosen pan with aluminum foil, making sure it comes all the way past the rim of your pan. Use a paper towel to wipe as much marinade off the surface of the duck as you can. Use a sharp knife to cut a cross-hatch pattern across the skin-side of the breasts about 1/2" apart (don't cut all the way down to the meat). This helps the excess fat render out from under the skin. Add the rice, black tea, sugar cinnamon stick and cloves to the foil lined pan, then put a metal rack down on top of the aromatics. I didn't have a rack that was small enough to fit in my pan, so I used some attachments off my food mill. The idea is to keep the duck off the surface of the burning aromatics, while letting the smoke circulate around the meat. Turn the heat on high until you see a few wisps of smoke coming from the pan. Place the breasts, skin side up, on the rack then cover with another sheet of aluminum foil. 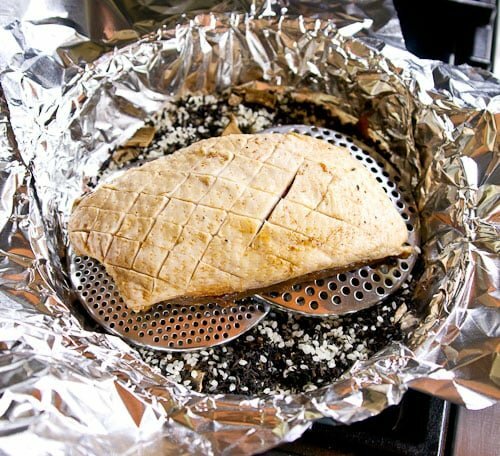 Cover the whole thing with a lid, then use oven mits to wrap the foil back over the lid. This should keep most of the smoke in the pan. Turn the heat down to medium and set a timer for 10 minutes. While the duck is smoking you can prepare the green mango slaw. Add the green mango, carrots, jalepeno, perilla, cilantro, garlic, garlic chives, lime juice and fish sauce to a bowl and toss everything together. Put your slaw in the fridge until you're ready to plate. When the timer for the duck goes off, turn the heat off, and set the timer for another 10 minutes. When the timer goes off again, open up the pan and throw-out the foil and burnt stuff at the bottom of your pan. Assuming your foil didn't leak and your pan is clean, turn the heat on to medium. Place the duck breasts skin side down on the pan and fry until the skin is browned and crisp (be careful as the sweet marinade will burn quickly). Remove the duck breast from the pan and let it rest, skin-side up, for 10 minutes. 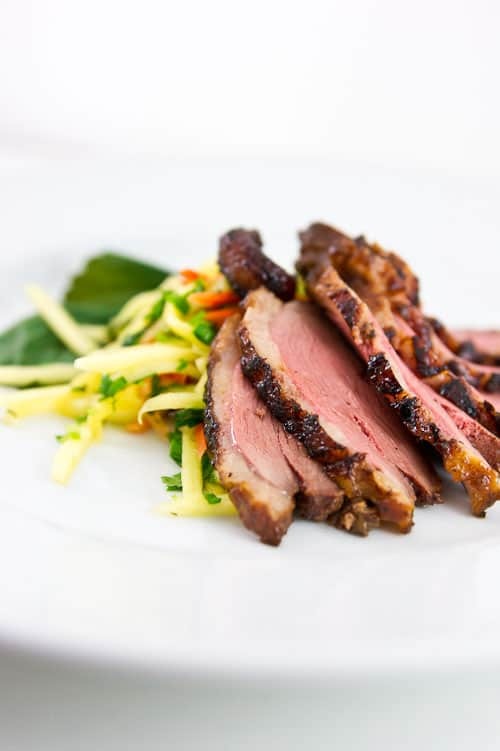 Slice the tea smoked duck breast and plate it on a bed of green mango slaw. Tip: When picking a mango, be sure to get one that is still very firm. If it gives even a little under moderate pressure, it's too ripe and will be soggy rather than crunchy. Marc, That’s a great photo. I expect after the session on Saturday, my photos will look the same. Right?! This looks delicious. I’m going to make the slaw without the fish sauce, to serve with Indian food I’m cooking. I just love duck and this will be an awesome way to do up some breasts. What do you think would be a substitute for perilla or shiso, neither of which we have here? Mizuna? Or…. I’m always so impressed by your adventures in the kitchen and really do enjoy reading about how your recipes came to life. This looks so perfect it’s amazing how you came up with it just by looking around your kitchen! Marc, wow I’m impressed with all of the enticing flavors going on in this recipe! Love the green mango slaw with the duck. 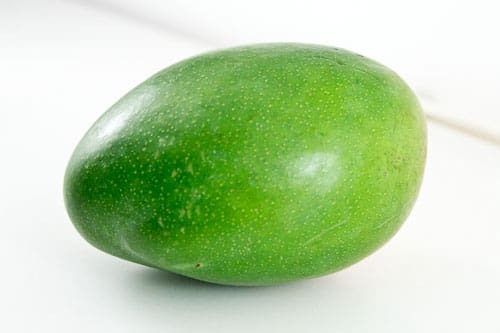 I love green mangoes, I cut them up and sprinkle with sea salt! That is a gorgeous dish! Lovely flavors. I enjoy duck but have never ventured to try making it myself. The whole recipe sounds like an adventure 🙂 I’d love to try this! Try Pakistani mangoes, they’re the best kind 🙂 cheers! With this recipe do you use already cooked duck breast or do you use raw? If you use raw how long would you cook that? Hi Hannah, sorry if the directions were unclear, but you use raw duck breasts and and it smokes for a total of 20 minutes (10 with the heat on 10 with the heat off) , plus the time in the skillet to brown/crisp the skin.